The Flute – Talk about old! The oldest known musical instrument is a Neanderthal bone flute, from over 50,000 years ago. It was made from the femur of a cave bear, was excavated from a campsite in Ljubljana, Slovenia, and has two complete, and two partial holes. Jump ahead a few thousand years to the Byzantine era ~ an era in which a transverse flute — played to the left instead of to the right — can be found in paintings from as early as the 10th Century. Westerners best know the transverse flute that was developed in Europe, although much of the world is more familiar with end-blown, vertically played flutes, like recorders. We've all blown across the top of soda bottle and made a sound, right? In essence, a flute is a hollow object that produces sound when the player blows air across a hole in its surface, or over an internal edge, activating the air in the tube, just like that bottle. Covering and uncovering tone holes control the pitch and the quality of the tone is controlled by the player's lips and the direction of the air. The flute is literally found in all parts of the world. The ocarina, the recorder, the kena of South America, transverse bansuri of north India or dizi of China are all flutes. The flute family includes the piccolo, "little flute" in Italian, which is pitched an octave higher than the concert flute. Then there's the alto flute, bass and even the ultra low sub-bass flutes. 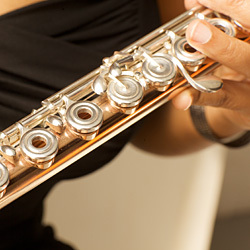 Today's modern flute uses wood, and metals like silver, nickel and gold. The first popular oboe-like instrument in Europe was the shawm, an instrument that sounds best out of doors, far away! Then they modified the instrument so it was a little more refined and the hautbois or "high wood" was born. Invented in the 17th century, the oboe is a double-reed wind instrument with a tri-sectioned hardwood body, narrow conical bore and moderate sized bell. The first oboes had seven finger holes and two keys. By the 1800's the instrument had fifteen keys and a twenty-note range. Contemporary oboes feature sixteen to twenty-two side holes that require manipulation of a complex key mechanism. Now that's progress! An oboe player gently blows air into the instrument. The blades of the reed vibrate as the air enters the tube. Air escapes the tube through an open key, but continues through the tube when the key is depressed. Using the keys, notes are played by changing the length of the instrument's tube, producing the subtle but poignant music. Due to its stable, penetrating sound and location in the middle of the orchestra, it's the oboe that calls the orchestra to tune before the rehearsal or performance begins. Because of the tiny opening in the reed, the oboe can "outblow" (hold a note longer) than any other instrument in the orchestra. The oboe family includes: the shinai – the ancient oboe from the country of India, still played today; the aulos – an ancient Greek double reed instrument; the tibiae – an ancient Roman double reed instrument; the oboe d'amour – the alto oboe; oboe de caccia – the older, curved version of the English horn; English horn – the modern tenor oboe that derives from the oboe de caccia; the bass oboe – a rarely used modern instrument, and the most "ducky" sounding of all oboes. The bassoon, contra-bassoon and bagpipes are all double-reed cousins of the oboe. The Clarinet – Ah, youth and versatility! Even though the clarinet claims Egyptian ancestry in the form of the memet around 2700 BCE, the clarinet we're most familiar with wasn't developed until the early 18th century, and became a major musical voice late in that same century. The memet, and instruments like it, were double clarinets – two tied-or glued- together tubes with two mouthpieces. A single-reed wind instrument like the saxophone, the clarinet is cylindrical in form and overblows a twelfth. With its remarkably broad compass, or scope, the clarinet was destined for a wide berth of variations: piccolo clarinet, sopranino clarinet, soprano clarinet, alto clarinet, bass clarinet, basset clarinet, basset-horn, clarinette d'amour and contrabass clarinet. That's a lot of clarinets! The five parts, or joints, of a basic B-flat or A clarinet fit together and are sealed by lightly greased cork. One of the critical factors in a clarinet is its mouthpiece. Tapered on the upper side to fit in the musician's mouth, the reed vibrates over a slot on the flat underside. The particular shape and finish of the mouthpiece heavily accounts for difference of tone and color, and as with the oboe, temperature and climate can influence how the reed responds, thus influencing tone. When a clarinetist plays her clarinet, her fingers and left thumb control the instrument's seven open holes and 17 keys. She takes the clarinet's weight on her right thumb – a thumb rest is conveniently placed on the underside of the lower joint. One of the most noticeable elements of the clarinet is its interconnected keywork, found on the upper and lower joints and bore, along with the finger-hole. The French horn – What's that brass player doing here? The horn (commonly known as the French horn) from the brass family, makes a case for inclusion by joining the woodwinds in a wind quintet. In an orchestra, the horn is a bridge between the strident brass and the mellow winds. Simply, a horn is a tube made into a curve, or circle. Uncoiled, the horn is as tall as the point guard on a varsity high school basketball team: over 6 feet! Its five parts: the body, bell, mouthpiece, mouthpipe and valve system are made of brass or nickel silver. The mouthpiece is inserted in the lead pipe, which is the first part of the tube. That connects to the tuning slide, which connects to the valve system, which is worked by the musician's left hand. The bell faces downwards and to the back. When you see the horn player put his right hand inside the bell, he is supporting the horn, adjusting the intonation and tone quality or providing interesting sound effects. In the 18th century, players adjusted some of the natural harmonics with the right hand in the bell, creating chromatic pitches. The valves do that job today. And now for a little "grossology"…guess what happens to all the hot air blown into the cool metal instrument? It condenses into what you might call "spit," that is, saliva which the musician must empty from his or her instrument periodically by removing the valve slides and... get ready for this!... dumping it on the floor! YUCK! All instruments have a lineage, and horns devised from many natural materials have been used through time for calls and signals. The horn's 17th century French relative was the trompe. Crescent shaped with a single coil in the tubing, the trompe was a hunting horn. Another popular horn of the time, the cor a plusieurs tours, was longer and coiled into a spiral. Remarkably, there were horn ensembles specifically for hunting! When do you think the bassoon was perfected: When it got to be about 8 feet long? When it became too heavy to lift? Yeah she's a biggie, but those features were disregarded in favor of perfecting the instrument's warm tone and magnificent range, which is about 3 ½ octaves – more than a flute. The basic stats on the bassoon are as follows: It's a wooden conical double reed instrument, (just like the oboe) which forms the tenor and bass to the woodwind section. The silver curved-shaped piece that the double reed goes on is called the bocal. It's found in two sizes: the bassoon and contrabassoon (or double bassoon), sounding one octave lower, which are the lowest instruments of all woodwinds, and the only wind instruments to be considered to improve with age. Why is that you ask? Well, it's because of its metal lining, which protects the wood from the inside out! How's that for thinking ahead?! The bassoon's substantial weight is supported by a neck strap or seat strap, which hooks into a hole at the bottom of the instrument. The bassoonist holds it at a slant across her body, with the left hand at the top and right hand at the bottom. Music for the bassoon is primarily notated in the bass and tenor clefs, with rare forays into treble. Today's modern bassoon has 7 feet 4.5 inches of tubing (the bore doubles back on itself; that design is courtesy of Alfranio Canon of Ferrara, Italy) and is 4 feet 3.5 inches when all four joints are put together. The bassoon is most commonly made of maple, with some successfully crafted in plastics, notably polypropylene. The most successful redesign was by Adam Heckel (c. 1820), widely regarded as the foremost maker of the modern bassoon. The German Heckel and the lighter French Buffet bassoons are played throughout the world. The beauty lies in the differences! Each instrument of the wind quintet differs considerably in technique, timbre, sound production and look. The combination originates from the music favored in the King's courts of late 18th century Vienna, which consisted of an octet of two oboes, two clarinets, two French horns and two bassoons. Composers like the ever-popular "Papa" Haydn (often dubbed "the father of the string quartet") enjoyed writing for this configuration so much, that he influenced other leading composers of the day to give it a shot, however they wanted to try writing for winds in a smaller, 5 instrument combination. The flute was added in order to represent all the principal woodwinds of an orchestra and to have a higher, soprano voice present. Also, progress was constantly being made on the technical quality of these instruments, which made the idea of creating new music that much more interesting. In other words, composers were really excited about the possibilities of writing for the wind quintet! Along comes Antoine Reicha (1770-1836) who gets his esteemed place in history as the founder of the wind quintet genre. Reicha wrote 24 woodwind quintets that form the core of our repertoire. Other composers of the 18th & 19th centuries, such as Cambini and Danzi, also took as stab at it, which added to the popularity of the wind quintet. Composing for our combination kind of fell off in the late 19th century…Ah, but the twentieth century yielded riches and continues to do so into the 21st century! Composers from Germany to Uganda, Denmark to Brazil, Hungry to the United States… all around the globe and from all walks of life and culture have now written for the wind quintet and the repertoire continues to grow! Sometimes, someone asks a simple question and your answer shapes your life. That's how our award winning flute player, Valerie, got started as a musician – when she was in the 5th grade, the music teacher at her school asked if anybody would be interested in band and the rest is flute history! She even started composing in middle school and went to college in Boston and New York for flute AND composition. Valerie is also the founder of Imani Winds, which goes to show that any dream you have can really come true! Toyin (pronounced like "I'm just toyin' with you") noticed that there were a lot of flute players in her middle school orchestra, so she shifted to oboe and took her lessons seriously. She ended up loving it and performing internationally at a young age in such places as South Korea and the former Soviet Union. Toyin has performed with a number of noted orchestras like the Chicago Symphony and the New York Philharmonic, and she also writes great children's stories. She has degrees from Oberlin College in Ohio, and the Manhattan School of Music in NYC. Toyin has a baby daughter named Chandani who has been spotted at many of Imani Winds' performances. Mark Dover discovered his love for music at the age of 10. He started on clarinet that year, and now almost 20 years later he is still playing! Mark also plays saxophone and piano, and he loves to compose music as well. He studied at the University of Michigan and Manhattan School Music. These days he travels all over the country and word sharing his passion for all types of music, whether it be classical, jazz, hip hop, pop, and more. He truly believes that you should always follow your heart and do what you love, and the rest will follow! "Opportunity is missed by most, because it is dressed in overalls and looks like work." - Thomas Edison Well, Jeff's hard work definitely paid off! His first teacher must have felt in her bones that her teenaged pupil would earn his free lessons from her. Jeff went to college for the French horn and got the opportunity to perform in an orchestra in Guanajuato, Mexico! (How cool is that!?) Jeff returned to NYC and worked, worked, worked — touring with pop stars, arranging music for jazz and classical groups and playing for Broadway shows and internationally- renowned dance troupes as a studio musician on film soundtracks. Currently, he arranges, composes, and is a college teacher. He was born and raised where we all now live, in New York City! Variety is the spice of life! Clarinet, piano, saxophone... why choose when you can play all three? Before the bassoon, Monica had a ball playing all of those instruments in orchestra, jazz ensemble, show choir and concert band. And at age 13, once she was big enough to play it, Monica added bassoon to the line-up, and stuck with it, with mesmerizing results. Leaving her Pittsburgh home, where her father played jazz sax, Monica ended up focusing mostly on the bassoon and has traveled extensively as a student and as a professional musician, performing at international festivals and with acclaimed opera, theater and dance companies. Monica's college degrees are from Oberlin College and The Juilliard School.